Old English was spoken from mid 5th century to the mid-12th century. It was a West Germanic language of the 5th century. The origin of the old English started from ingvaeonic also called “Germanic of the North Sea”. Ingvaeonic was named after a West Germanic proto-tribe cultural group called Ingaevones. This language was a grouping of Old Frisian, Old Saxon and Old English. Later it developed into Anglo- Saxon language, the language spoken by people living in parts of modern England and Southeastern lands of Scotland. Anglo–Saxon was developed only after 7th century after Christianization. It was constantly influenced by many languages. It has three subdivisions, prehistoric- between c.450- 650.Early Old English between c.650- 900 and Late Old English between c.900-1066. Old English was influenced by Latin, Norse and Celtic. Latin influenced it in three periods, firstly, when the Anglo-Saxons went to Britain, secondly when the Latin speaking priests converted the Anglo- Saxons to Christianity and lastly when the Normans conquered England in 1066. The second language influencing old English was Norse; it began with the Scandinavian words being introduced after the Vikings invaded England in the 9th and 10th centuries. Celtic’s major influence was mainly on syntax and not on vocabulary. The morphology included accusative, dative, nominative and instrumental. At first it was written in runes then in half uncial till 9th century later in insular script till 12th century. Early Middle English developed from late Old English in the second half of 11th century. It was spoken during 12th and 13th centuries. By the second half of 14th century, it became popular as a literary language. Finally in the 15th century the Late Middle English started transitioning into Early Modern English. Middle English gradually ended the Wessex, as the writing language and emerged as the focal language for writers and poets. Many regions had their own dialects and there were variety of different writing styles. It became more prominent in the 14th century, in the 12th and 13th century it was more Anglo-Norman. It had many dialects in different regions but during 15th century, printing began in England (1470) and the language started becoming more standardized. The language became more like Modern West Frisian, a Dutch related language than the Germanic, because of its simplification. All the letters were pronounced in Middle English there were no “silents” but by Chaucer’s time the final “e” became silent. 1.Old English was the language spoken during 5th to mid 12th century; Middle English was spoken during mid 11th to late 15th century. 2.Old English developed and originated from North Sea Germanic; Middle English developed from Wessex. 3.All the letters were pronounced in the language and there were no silent; in the late Middle English during Chaucer’s time silent words had started being observed. 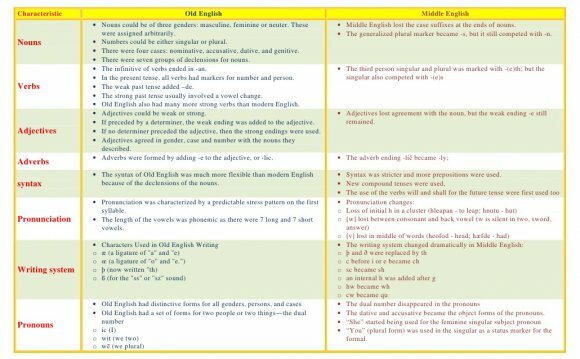 4.Old English had many dialects and was never standardized; late Middle English started getting standardized by 15th century. The Saxons (Latin: Saxones, Old English: Seaxe, Old Saxon: Sahson, Low German: Sassen) were a confederation of Germanic tribes on the North German plain, who during the Middle Ages migrated to the British Isles and formed part of the Anglo-Saxons.